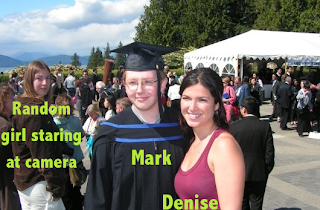 Sixteen Months in Dominica: You can't spell "Marriage" without "I Am Rage"
You can't spell "Marriage" without "I Am Rage"
Mark and I before we started dating. Mine and Mark’s (Mark’s and my’s ??) wedding is less than 11 months away. I have already started making appointments for our 14 precious days in Toronto/Vancouver this August. So far on the itinerary we have meetings with churches, wedding dress shops (in Toronto & Vancouver), jewellers, photographers and other miscellaneous suppliers of wedding services. Between trying to catch up after a week of being sick in bed and planning our wedding, I am almost certain that I am having multiple tiny seizures throughout the day. Thank God for my wedding planner or they would be straight up rage black-outs. In an attempt to keep myself sane, I have gotten into the habit of giving Mark what I lovingly call “Wedding Homework” to take some of the burden off of myself. He always does it without complaining, and (usually) in a timely fashion. historians and storytellers have been looking for an example of perfect love. A love so passionate and astounding that it makes the heart soar. This Spring, come join us for our special day, as we commit to each other, and hope that the human race at some point finds the love I have previously mentioned. See you there! When they first met, Denise didn’t like Mark at all. Now he’s tricking her into marrying him. 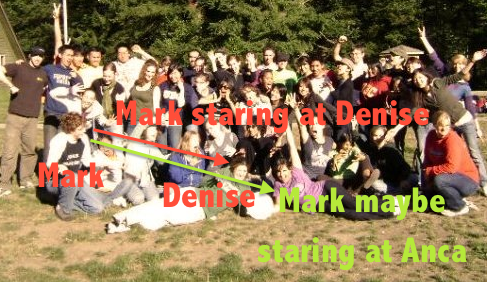 This is a photo from the Speakeasy training camp where Mark and I first met. He's right. I thought he was a pretentious douche bag. Now, I KNOW he's a pretentious douche bag, but I love him anyway. We’re getting hitched this Spring, and there is a very little amount that anyone can do about it. We spent a lot of money on a nice venue so please dress to kill. Imagine what she’ll look like in an expensive dress. We won’t show you pictures unless you come. and Denise got herself a guy with a great personality. We have a pot going on how long this will last, but only if you show up! He definitely nailed the “reflects us as a couple” part. I like 1 the best...2 is pretty good too! 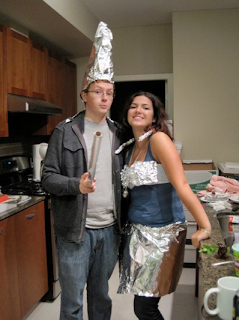 #2 and include the tinfoil picture! To love Dominica, or not to love Dominica? On the riots in Vancouver. All Quiet on the Dominican Front.